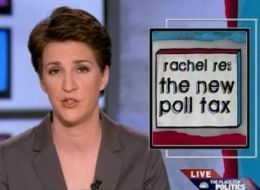 Voting Rights Watch: Rachel Maddow calls long lines "the new poll tax"
Riffing on a theme Facing South raised two weeks ago -- that long voting lines are a voting rights issue -- rising star MSNBC commentator Rachel Maddow yesterday called long lines "the new poll tax:"
This is a poll tax. How much do you get paid for an hour of work? Do you have the kind of job that would be delighted to give you an hour, a half-day, a whole day off work because you were waiting in line at your precinct? Even if it won't cost you your job, can you afford to not work those hours? Are you elderly or disabled, do you not have the physical stamina for this kind of exertion? This is a poll tax... Who is not in those lines -- because they can't afford to be? Long voting lines have lead to major battles in states like Georgia, where Republican Secretary of State Karen Handel invoked the Voting Rights Act as a reason for not extending voting hours, despite voters having to wait eight to 12 hours to vote (no, that isn't a typo -- twelve hours). The South and "the Great Gerrymander of 2012"
More on (Bill) Clinton and "the race card"
Is the South "the Other America?"